Streptavidin (CAS Number 9013-20-1) is a tetrameric protein secreted by Streptomyces avidinii which binds firmly to biotin. Streptavidin is wilyde used in molecular biology through its unique high affinity for the vitamin biotin. The dissociation constant (Kd) of the biotin- streptavidin complex is about ~10-15 mol/L. The strong affinity recognition of biotin and biotinylated molecules has made streptavidin one of the most important components in diagnostics and laboratory kits. The streptavidin/biotin system has one of the biggest free energies of association of yet observed for noncovalent binding of a protein and small ligand in aqueous solution (K_assoc = 10**14). The complexes are also extremely stable over a wide range of temperature and pH. Streptavidin (CAS Number 9013-20-1)) has been tested in Pretargeted immunotherapy. It was conjugated to a monoclonal antibody against cancer cell-specific antigens. When the conjugate is sticked to the cancerous cells, an injection of radiolabelled biotin enables to deliver the radiation only to the cancerous cell. The endogenous biotin binds the streptavidin prior to the injection of the radiolabbeled biotin. 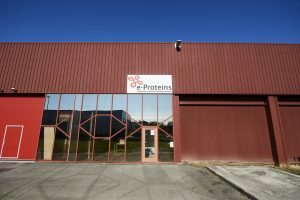 As avidin has no RYD segment, it offers better perspectives in biotechnologies applications e-proteins develops new derivatives to address this new market. for increased signal output and greater sensitivity. Fluorescent conjugates of avidin/ neutralite avidin/streptavidin are used to detect biotinylated biomolecules such as primary and secondary antibodies, ligands and toxins, or DNA probes for in situ hybridization or bead-based detection. Enzyme conjugates of avidin/ neutralite avidin/streptavidin, such as HRP and AP, are commonly used in western blotting, ELISA, WB, ICC, IHC and in situ hybridization imaging applications. Avidin/ neutralite avidin/ Streptavidin-conjugated magnetic beads and resins are employed for isolating Cells, proteins and DNA. Those conjugates are also employed in immunoassays or bio-panning. Looking for a higher signal intensity ?